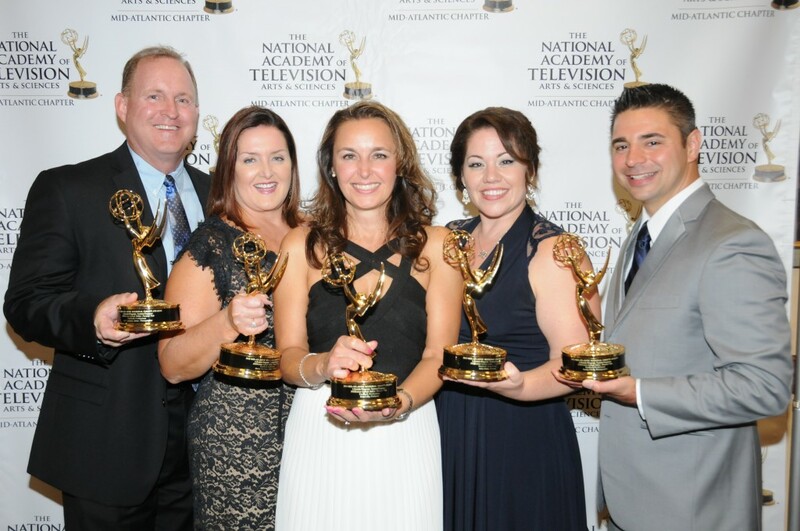 LEHIGH VALLEY, Pa. (September 21, 2015) – Discover Lehigh Valley took home a Mid-Atlantic Emmy® Award for the Lifestyle Program Feature/Segment category in a ceremony held at the Philadelphia Hilton, 4200 City Avenue, Philadelphia, Pa. on September 19. The winning piece, DISHcover Lehigh Valley: Porters’ Pub, was produced and hosted by Kim Lilly in partnership with Fire Rock Productions of Emmaus (Julia Urich, Director; Rocky Urich, Photographer) and Countess Communications of Allentown (Marta Countess, Associate Producer; Jeff Countess, Associate Photographer). This is Discover Lehigh Valley’s first Emmy® nomination and first win. The DISHcover Lehigh Valley series explores local restaurants with a behind-the-scenes look at what makes each establishment unique. The Porters’ Pub episode highlights the history of the pub with owner Larry Porter, as well as the restaurant’s impressive food menu and extensive craft beer offerings. The award-winning video can be seen on Discover Lehigh Valley’s television channel, available on RCN and Service Electric on channel 189, or online via YouTube.